If you're in New York, you are invited to a screening of the acclaimed documentary Who Killed Vincent Chin? as part of the Chatham Square Library's Chinese in America Film Series. They'll be showing a 16mm print of the film with associate producer Nancy Tong in attendance for a post-screening Q&A. The Academy Award-nominated film tells the story of the fatal 1982 beating of Vincent Chin in Detroit, and the ensuing civil rights battle that galvanized the Asian American community. Saturday, December 17, 2016, 2 p.m. 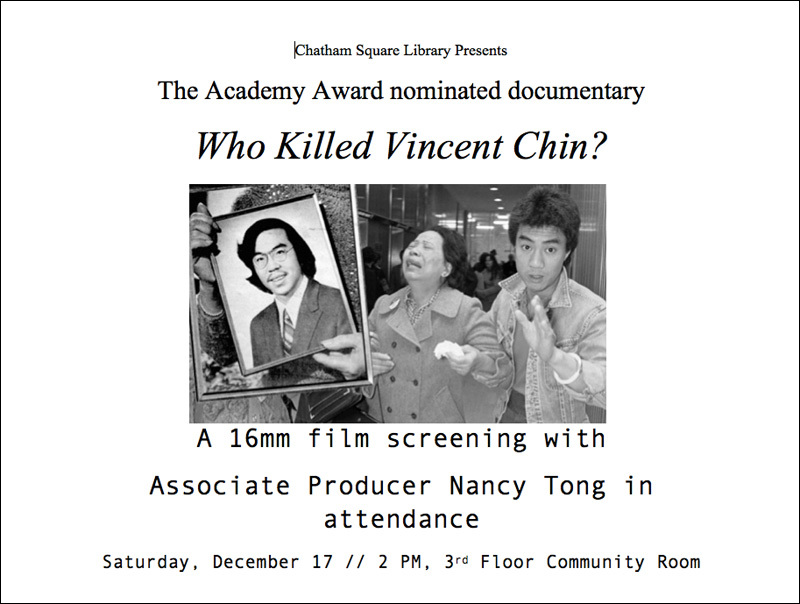 Please join us on Saturday, December 17 at 2 PM for a very special film screening of Who Killed Vincent Chin?, an Academy Award nominated documentary film (Best Documentary Feature, 1989). This film will be screened in 16mm. Associate Producer Nancy Tong will be in attendance for a post-screening Q&A. This is part of Chatham Square Library's Chinese in America film series. Vincent Chin, a successful engineer living out his dream of designing automobiles in Detroit, meets an unexpected and violent end when he is assaulted and killed by two men in the summer of 1982, following an altercation at a bar. Despite their bloody crime, the assailants initially receive lenient sentences due to a plea bargain. The troubling outcome of the case outrages civil rights advocates, who fight for justice and struggle to prove that Chin's attackers had racist motivations. This documentary is just as important in 2016 as it was when it was released. The themes of economic strife, crumbling blue collar industries, and the racial tensions that result from these struggles are all issues America is still dealing with to this day. This screening is first come, first served. This is not a ticketed event. All NYPL programs are free of charge. This film changed my life. It's required viewing, in my book. If you haven't seen it, and you get the chance to watch it in community setting, take the opportunity. For further information about the screening, go here.